Mills & Boon have partnered with The Reading Agency to champion mobile libraries and celebrate Valentine’s Day. Over 70 mobile libraries around the UK are taking part in our #RomanceOnTheRoad campaign, which runs from the 6th – 20th February. Virginia Heath is of our wonderful authors in the campaign and talked to us about libraries, and what they mean to her. Do you have special memories of a favourite library? There was a library just five minutes away from my house growing up, so I went there often. Back then my parents didn’t have much money, and I’ve always loved reading, so the library was a bit like Christmas morning. They had a huge room dedicated to children’s books and I remember there was always a new display of the latest releases or old classics to tempt you. I spent hours choosing exactly the right books and the ceremony of taking them to the desk, handing over my library card and having the books stamped with a return date was always the best bit. I remember being bought a toy post office, which had a date stamp in it, and stamping all my own books for my dolls while I played at being a librarian. Years later, I used to go there to study because it was quiet. That library saw me through O levels and A levels, so I have a lot to thank it for. At school, the mobile library used to visit once a fortnight and each class took it turns to visit it. I loved it! It was like being able to play truant from class but with books. And later, when I had my own children, we used to visit the mobile library when it came down our road. Sadly, my library no longer has the mobile van which is such a shame. Was there a librarian who specially inspired you? Yes! When I was a secondary school teacher not so long ago, the school librarian was brilliant. She was a font of knowledge and had a real way with the students. She used to take special classes for some of the children who struggled with literacy and never made them feel uncomfortable when they stumbled over words. So many of those children went on to develop a love of books and stories as a direct result of her. Can you remember your first visit to a library? I’m not sure if it was my first visit, but I have a hazy memory of going to my local library with my mum and picking up a book that was brand new. It felt new, smelled new and when I checked inside on the label, I remember being delighted to see nobody had ever taken the book out before. I was the first child to read it, and I recall that made me feel special. It clearly made an impression on me if I can still remember it forty-something years later. What books do you gravitate towards when you go to a library? Romances, of course, because those will always be my favourite type of books. But I also find myself wandering around the history books. I might not be a history teacher any more, but I still love to learn about the subject. Why do you think libraries are important? As more and more councils tighten their belts, it seems one of the first things that go are the local libraries. I wish they would turn out street lights in the small hours or cut back on something else instead, as local libraries are the heart of the community. People of all ages can go there to seek knowledge, entertainment or a quiet place to work. Most libraries organise talks or events, mother and toddler groups, reading groups. Students can go there to find answers and children learn that books are their friends. For some children, the library is the only place they encounter books, and with literacy declining it strikes me as sad that so many libraries have closed. Thank you, Virginia, for taking the time to talk to us! 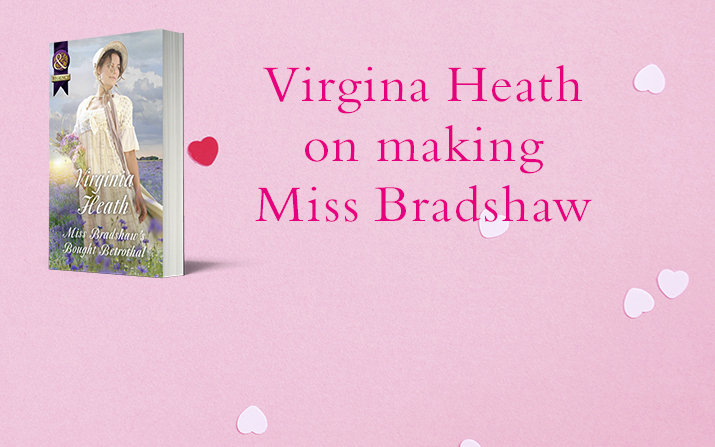 Virginia’s new book, Miss Bradshaw’s Bought Betrothal, is out NOW!